24shots releases the Silencer focus control system. Well known for their unique trigger controlled dslr focus puller providing operators the ability to keep both hands on the rig, maintaining stabilization and allowing true run and gun shooting for filmmakers. 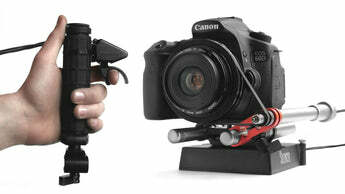 The Silencer Follow Focus offers full control to the filmmaker or follow focus puller. The system quickly mounts to any camera. The dslr focus puller can take full control of the lens on any kind of rig including gimbals, steadicams and other handheld rigs.